"Lovers of historic performances on film have had an increasingly good time of it in the last decade. Various archives and television companies have been opening up their heirlooms and culture-minded satellite broadcasters – German as often or not – have shown an exceptional amount of rare film. So we live in fortunate times, even if what remains reminds us of the vast amount that was lost or never recorded in the first place. Cembal d’amour has had the savvy idea to collate some famous films. I last saw the Feuermann on a Cello Classics release. 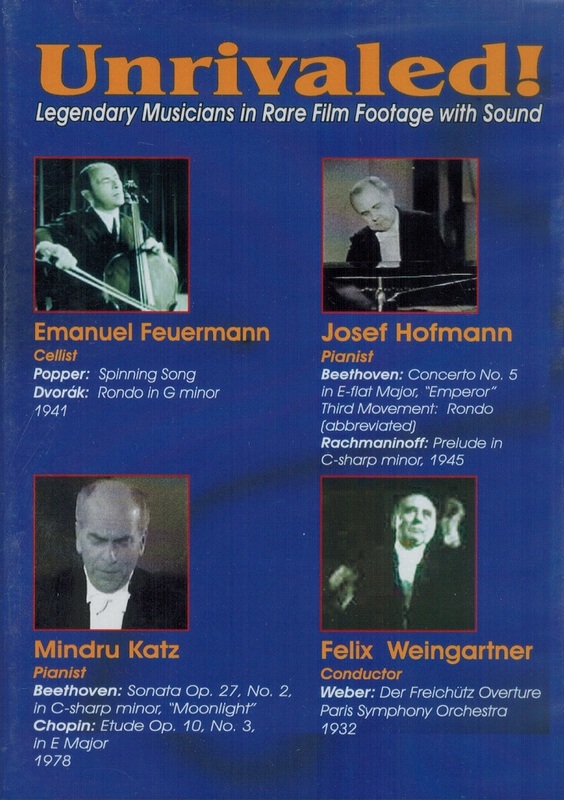 The Hofmann Rachmaninoff was on the Art of Piano DVD though I’ve never before seen the abridged 'Emperor' Concerto with Voorhees, though doubtless it’s done the rounds. The Weingartner was on the Art of Conducting and I saw the Bruno Walter-Weber last on Bel Canto’s Great Conductors, Volume 1. 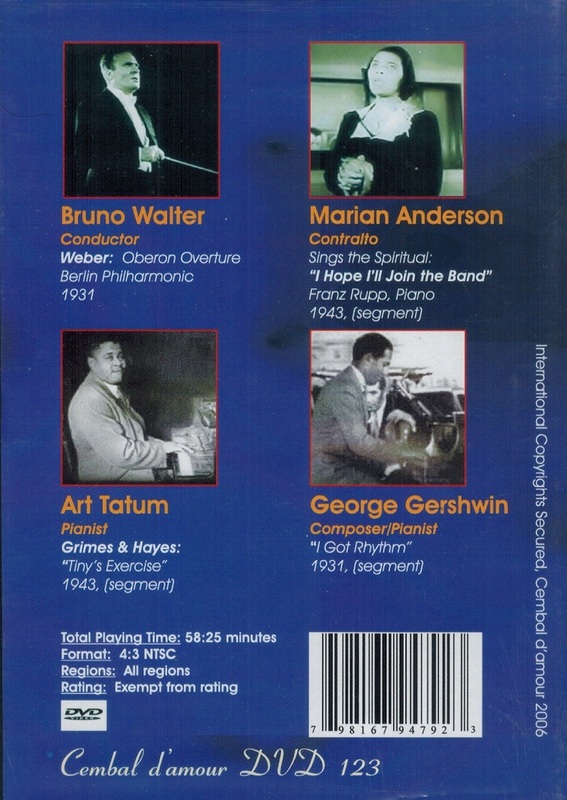 The very brief excerpts of Marian Anderson, George Gershwin and Art Tatum have made appearances on television over the years – you can never forget Gershwin’s swaggering grin as he dismounts after 'I Got Rhythm'. Which leaves the big rarity, though of a musician of a much later generation; Mindru Katz. This was taped as late as 1978. Feuermann is shown in Popper and Dvorák. As ever he is imperturbable, impassive, amazing. The camera angles are rather tricksy – close-ups of the fingerboard for example - and directly over the cellist’s left shoulder. One watches the bewildering left hand work raptly and – little miracle – in the Rondo, Feuermann even, just slightly, raises his left heel in excitement! His accompanist – and the word is appropriate here – is the distant, semi audible Theodore Saidenberg in this 1941 performance. A year later Feuermann was dead. There is a brace of conductors in well-loved performances. Weingartner is his usual self-effacing self in Paris in 1932 but he is a master of economy and efficiency with a baton technique that reveals all that’s necessary to cue entries, enforce the rhythmic basis of the music making and bring out expressive moments. Bruno Walter is heard in less than optimum sound and vision but this 1931 Berlin film offers compensations. Walter is on splendid form encouraging some suavely sensitive phrasing from the band, amongst whose serried ranks must be Szymon Goldberg – then just about ready to supplant Henry Holst as concertmaster. Mindu Katz was taped in Istanbul in 1978 playing the 'Moonlight' Sonata and the Op.10, #3 Chopin Etude. Like the companion films, this is in black and white and there are blips and drop outs on the audio tracks, which is also 'noisy', rather as if there was inherent rumble. He is seated in an empty concert hall in tie and tails. Despite the rather imperfect nature of the recording we can still appreciate the level of artistry, the profound sensitivity to production and layering of sound, evinced by Katz. It’s playing of rare sensitivity and insight, confirmed by his Chopin, which is highly reflective. Only a few hours later Katz died of a heart attack during the evening’s recital in Istanbul. He was fifty-three. There’s a helpful booklet and DVD navigation is perfectly straightforward. Inquisitive, visually minded souls should seek out these films."